Tonight, I’m going to review B.A.P’s latest album, First Sensibility. B.A.P is a Korean boy group from South Korea, made up of six members, as follows: Bang Yongguk, Kim Himchan, Jung Daehyun, Yoo Youngjae, Moon Jongup, and Choi Junhong (AKA Zelo). I listen to a variety of music, including K-pop, but B.A.P is by far my favorite Korean boy group and definitely in my top ten list of musical groups/artists all together. Their music tends to be very powerful, carrying strong messages and featuring lyrics that don’t always focus and revolve around love and romance. Of course, they have their occasional light-hearted romps into romance, but as a whole, they do tend towards a more powerful group. 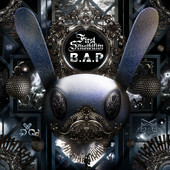 First Sensibility is their first full-length studio album and it was released on February 3, 2014. It’s a little late but since I’m going to the concert in April, I figured I could celebrate with a review! Bang Yongguk is credited in the lyrics of every song, so he had a strong hand in the creation of this album. Because of that, I think this album is especially personal for him, at least, if not the entire group. So what about the songs? Let me go through each one and review them piece by piece. The last song is With You. Aw, look, we’re at the end of the album! Another light and affectionate song, I adore this one. It’s very soft and almost like a lullaby. We all need a little fluff in our lives. There’s not much else to say about this song, but I really love it! So… A! So all in all? I’d grade this album as an A or a five out of five stars. There are a few songs on it that I don’t love dearly but there’s nothing on here that I want to smack my head against a wall for listening to. There’s a good mix of music on here, even spanning genres and I love it. I think there’s something for nearly everybody on this album and I think you should definitely check it out!